Casper Wells | got milb? The mystery for the ages is solved. At least we think it is. “Monkey guy with the floating thing” = Reggy. At least we think it does. For those of you who are only occasional readers of GotMiLB, rather than those who constantly hit refresh in hopes of new and thrilling copy (and I LOVE all two of you who do that), let me recap. 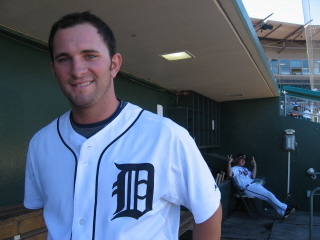 Last week, we ran this interview with Detroit Tigers outfielder Casper Wells (that’s him in the picture above). After a query to colleague Ben Hill, the guru of all things Minor League Promotion-al, came up blank as well, GotMiLB went back to Wells to see if he could shed any more light on this mysterious “monkey guy with the floating thing,” you know, ANYMORE details he could provide. Because I am, if nothing else, a tenacious reporter, I started doing the homework. Luckily, Oneonta had only made one road trip to State College in 2007, so I was able to hone in on the dates July 11-13. Next, I went to the State College Spikes website and bless their hearts, it had an archive for all of their press releases, including one that alerted fans to the upcoming promotions for, you guessed it, that week. And voila, we bring you … REGGY, the Purple Party Dude. But he’s the only “character” that appeared at State College in those three days (unless you count former American Idol finalist Vonzell Solomon, aka the singing postal deliverywoman, performing the National Anthem). And among his “routines” are this nine-foot blow-up monkey. So I think we have a winner.